Every now and then, a client will ask me what oils or lotions I use when doing a massage. A good question, really. And trust me, this is something that a massage therapist spends a lot of time thinking about. When I first started massage, I used a combination of oils that included (but were not limited to…) almond oil. Eventually, I decided against almond oil and others like it, because I found them too heavy and the residue left on sheets started to smell like… well, rancid oil. Not a great scent for a relaxing massage. 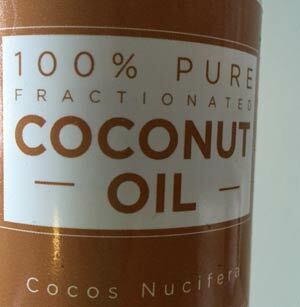 After much experimentation, I’ve settled on fractionated coconut oil. This is coconut oil that has been treated so that it doesn’t get hard in cold weather. Fractionated coconut oil is always liquid. Coconut oil is also incredibly light, and very slippery so I do not have to use much of it. What I do use seems to soak nicely into everyone’s skin, leaving it softer and suppler. A nice side effect of a good massage! Oh, and coconut oil doesn’t go rancid so it does not smell on your clothing or the sheets either. That means that the only scent greeting your nose during your massage will be the essential oils in the steam from the little vaporizer in the corner and on my fingers for your olfactory pleasure at the end of your massage. As it should be. But coconut oil is not a great medium for the more detailed magic that I work on your hands, feet and neck. For that I need something a little less slippery but just as pure. For that, I use Sacred Earth vegan massage cream or Bon Vital Deep Tissue cream with Jojoba oil. 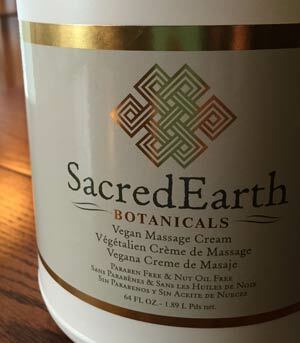 Sacred Earth Vegan massage cream boasts that it has no parabens, no fragrance, no nut oils, no gluten (not that we are eating it…) and it is cruelty free. That last point is rather important to me… there was no animal testing of this product. What Sacred Earth Vegan massage cream does have is sunflower oil, aloe, lavendar, calendula, white tea, German chamomile, arnica montana, organic cannabis sativa seed oil, and vitamin E. It is really good for your skin and tends to soak in without leaving much if any residue. 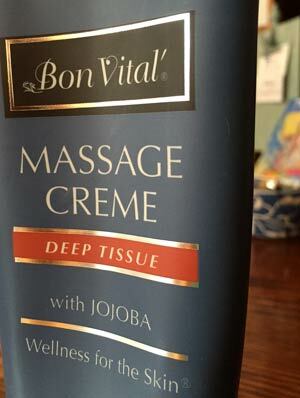 The Bon Vital Deep Tissue cream is also free of parabens or nut oils. It has sesame seed and grapeseed oils, jojoba seed oil, avocado oil, a number of vitamins (B5, C, A and E) and some fragrance. To be honest, because of the fragrance and the number of unpronounceable chemicals in it, I am phasing this one out. However, it too is cruelty free! 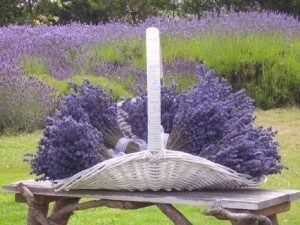 At the end of each massage, I like to treat my clients to a whiff of something wonderful… these days it is one of three different kinds of lavender harvested and pressed into essential oil on Whidbey Island near Seattle. Other days, it is something wonderful from DoTerra. 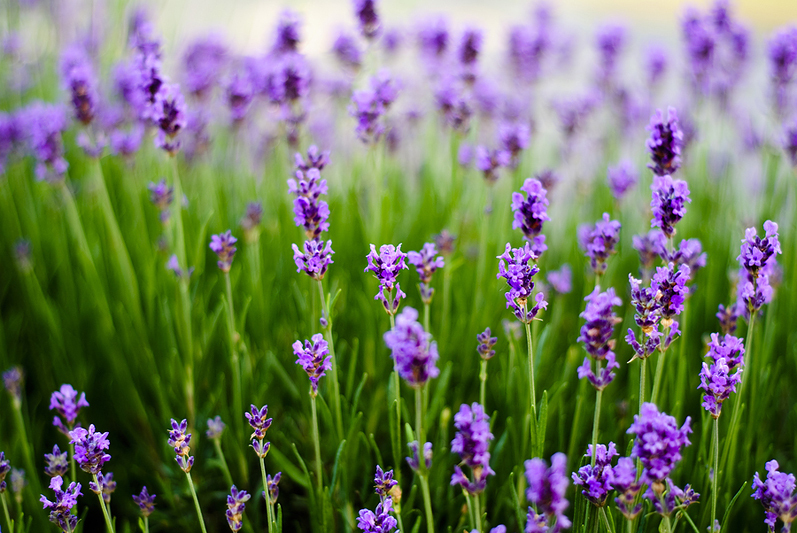 A deep breath or two of this relaxing scent is just the thing to end an hour of relaxation and rejuvenation. So when you come to see me, now you know what I will be using to give you that wonderful massage!